Kikay Pinay just got her facial today because a very big zit took comfort on her chin. Today, I was browsing through the beauty clinics located at the fourth floor of the mall and saw what a fab interior this new facial center have. SKIN STORY is a SOUTH KOREAN based facial skin center known as White Club International. It has over 110 skin care center all over the said country. And now is available to us Pinays and Pinoys. :) The Skin Story is only a week old here in Manila. They use TRISHA cosmetics used by special skin care centers all over Korea. Facial starts from Php250 up to only Php1,300. They will first offer you Natural Skin Story Analysis that determines what skin type you have. This will also determine the which program would best suit you. I didn't need that since i already know what i want. Maybe in my next visit, i will have my skin analyzed. I immediately told them what i want and I was first offered BLUE 2 (Php350) which is a Basic Facial with Pricking. Then the attendant says that if i wanted i could upgrade it to their Special treatments that is focused on Skin problems. In my case, it was the Oil Control which is only (Php450). Super cheap right? The place is very chic and quiet, with only the relaxing music in the background. You will be shown to a very spacious room will several beds in it. The beds are apart from each other providing you with a lot of personal space. No tabi-tabi system here.. No crawling either to your bed. Most espcially, it is away from prying eyes of people walking by the mall. It certainly provides you privacy. something i definitely appreciate. The facial is OMYGAWD great! and i am not kidding here. i never had my face massage that way before. 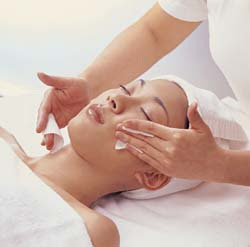 There is much facial massage since it helps the blood circulation on your face that will give you a healthy glow after. I simply can't express how circulated the blood in my face is. the products that were used smells wonderful, no industrial smell or alcohol smell. Every step was very much anticipated. :) I love the fact that the products used are all Natural. My oh my! i wish i could do it over and over again. Except the pricking part. Hehe! My face was deep-cleansed by aromatic gels and creams. My zit was also treated. Yey! I also notice how generous they were with their products. they also use Blemish balm cream and that they have a very different approach in doing facial. They don't use a lot machineries as well. It pretty much hands on. Which again, i appreciate. I also appreciate how patient my attendant was since i asked her a lot of question and that i have a low pain threshold. She has to be a extra careful with the pricking part. 2. The place is very nice and privacy is well provided. 3. The aesthetician who is very patient and did a great job on the Program availed. 5. Products used are Natural. 6. Sytematic Treatment. The step by step of the each program is provided for you. You won't ever wonder what is going on. The transparency of Skin Story Treatment is a definite plus. 8. VIP card is provided (free treatment after your fifth visit). Yey! 9. They don't offer you to buy products and avail of more treatments or masks etc! isn't that annoying sometimes? So, who takes care of your skin? I seriously want a facial right now because of my annoying blackheads on my chin and nose. How I wish that they can be all over the place like lets face it. The location is a real issue to me as I can get easily lost.